Nirvana just before her renaming ceremony! Since our haul-out of Nirvana back in April-July 2010, we've had several inquiries as to how much it all cost. I had an idea, but had never gotten around to adding the numbers together. Almost 3 years later, I've finally got the figures ... better late than never! Ken and I had figured we'd spent around $3500 on the project. We were pretty close, and actually spent a little less. It's very possible we lost a couple of receipts on the small stuff, but this breakdown should be really close. Surely we must have forgotten a few sheets of sandpaper ... I was constantly buying that stuff! Here's a review of our costs, including 8.75% Louisiana sales tax and/or shipping where applicable. Some of these items are highlighted with a link, which will bring you to our post that we wrote about that topic and/or product link. Sorry the figures aren't in a pretty line! I thought they were ... until I was no longer in draft. Will have to clean it up when I have time. Blister Repairs ... about 81 blisters! Strut Tightened .. Not as easy as it sounds! * Some of these items were purchased at a discount, such as the boat paint which was purchased at a pretty good discount from a local hardware store that was going out of business. The 3-blade prop was paid at full price, but the sale of the 2-blade prop was applied to its purchase. So there ya have it! Hope this helps give an idea of what this stuff costs. Gathering all the receipts has got me working on the costs of everything we've spent since Nirvana's purchase. I posted a new page called, "Pre-Cruising Expenses" if you wanna see what all of this has cost us so far. We have our hauled out every three-four years. It's expensive indeed and often you don't really know how much it's going to cost until you get her out and find out what needs doing. Got to do this though. Just curious...when we owned Logos, we were told to do a haul-out, scrubbing, and new bottom paint every two years. That was one reason I lost my interest in owning a sailboat. Although we did most of it ourselves the first time, it was a LOT of work (in addition to being expensive), and, while kind of exciting to do once, I just couldn't imagine doing it again two years later. Are you going to be hauling out again this summer? And if so, how do you feel about it? A haul-out is expensive, and a lot of work! Hopefully the next time we pull Nirvana out of the water we won't have so much to do. We plan on doing a haul-out shortly before we start cruising. In the meantime, we've hired a diver to clean the boat's bottom every 6 weeks and change the anodes whenever necessary. He says our bottom looks great! I think every 2 years isn't necessary here in Louisiana, especially since we used a good barrier coat and copper paint. It won't be that much work or that much cost next time if you did a good job this time in the prep work. We hauled out Moonrise when we first got her and it took forever to prepare her bottom for paint, repair cosmetic blisters (slows the boat down, don't you know), etc. Two years later we hauled out again and it was just a breeze. almost no sanding required, just alight going over with the electric sander rented from the marina, then two coats of bottom paint. If the weather had cooperated we could have splashed her back the same day. I like hauling out, even though it costs us about 450$ just to haul out, power wash, and placed on jack stands. I like seeing her bottom so I can tell what kind of damage I've done on all those uncharted rocks. And repair it. Yes, repair is a good thing. :) Isn't Nirvana's bottom lovely? She's a lovely girl, indeed. Nirvana looks great! Nice job. 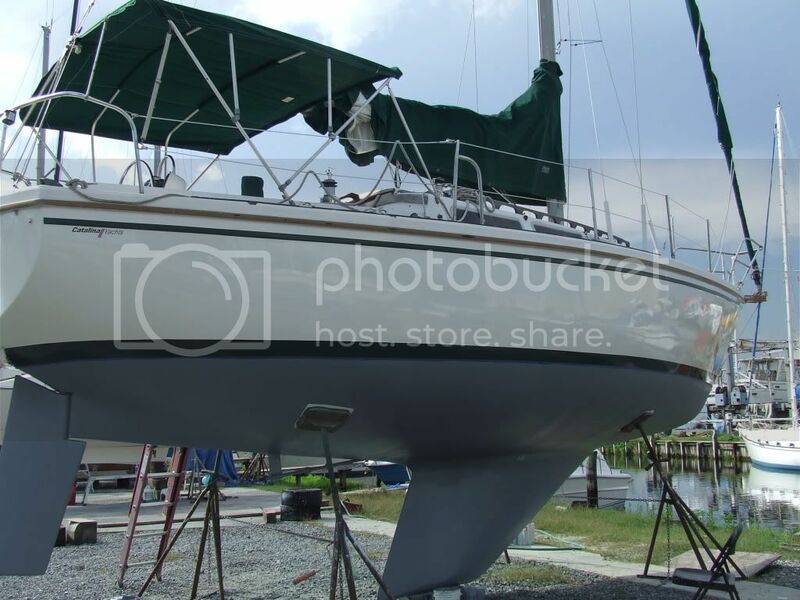 I put a new bottom on our old 25 footer, after removing all the bottom paint by sanding. I was covered head to toe in red ablative, and the sanding disks kept flying off the sander going God knows where. Took weeks for the paint to come off. It rained one day while sanding and it looked like I just stepped out of the shower in the Bates Motel. I was young and stupid. Not looking forward to this boats bottom. Stick with the 30 footer. Small is easier. So glad we found your page. We are planning the same life soon as well. Is a haul out necessary with Fiberglas also? As we are leaning toward a 40ish foot catamaran.